LONG BEACH, California (April 10, 2019) - With the 2019 NTT IndyCar season in full swing, AERO Sustainable Paint Technology teams are working in full force as the series makes the quick turnaround from Alabama’s Barber Motorsports Park out to California for the Acura Grand Prix of Long Beach this weekend. The event weekend will also see Round 3 of IMSA WeatherTech SportsCar Championship competition. On the other side of the timezone map at the Circuit Paul Ricard in Le Castellet, France, both the European Le Mans Series as well as the Michelin Cup will both be staging their opening races of the 2019 season. 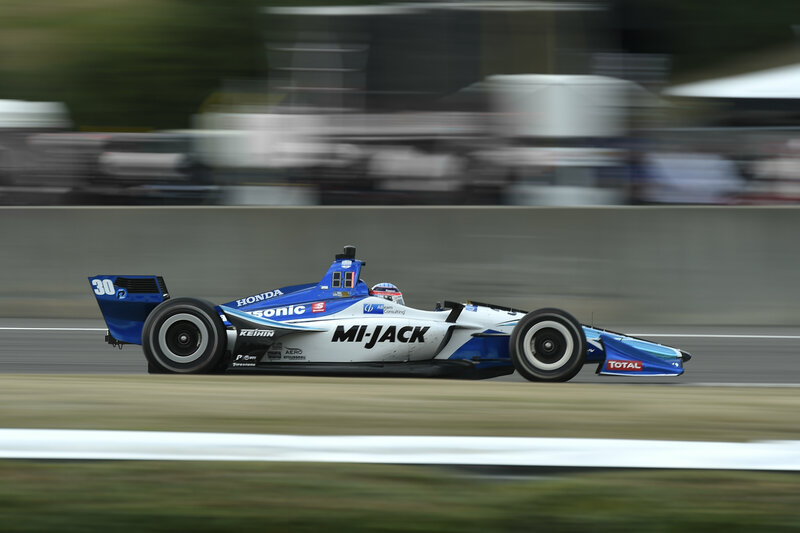 It was a front row sweep for AERO at the Honda Indy Grand Prix of Alabama last weekend as the Rahal Letterman Lanigan (RLL) team monopolized the front row for the 90-lap event. But there can only be one winner, and it was Takuma Sato who brought his No. 30 Mi-Jack / Panasonic car to victory lane on Sunday. Unfortunately his RLL teammate, Graham Rahal didn’t make the finish of the race after a mechanical issue left him stranded on course as he looks for a reboot at Long Beach with the No. 15 One Cure machine. Meyer Shank Racing was another promising representative of AERO Paint during the Barber weekend. 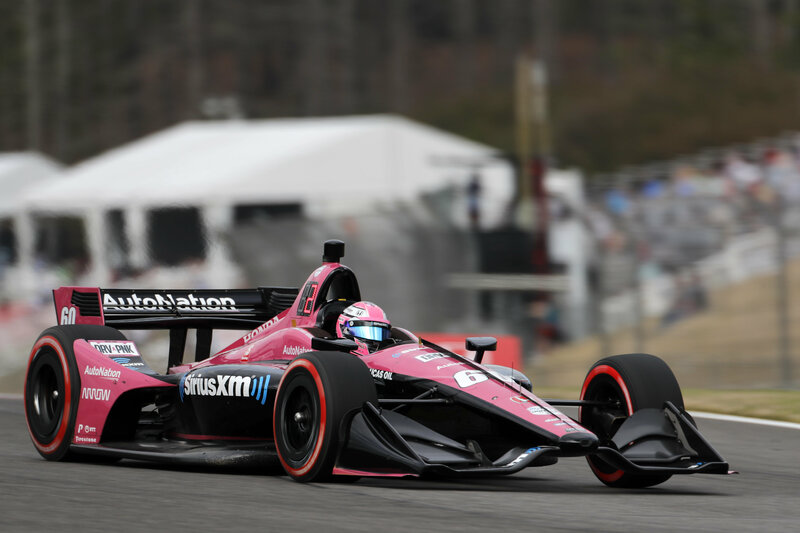 The custom pink color, which was designed as part of AutoNation’s Drive Prink campaign, showed well in qualifying before a pit lane speed infraction cost the squad key track position on the way to a 13th place result. The A.J. Foyt Racing pair of Tony Kanaan and Matheus Leist were targeting a stronger result than what the 18th and 20th place finishes showed. Kanaan, who was on a bold strategy that was shooting for a top-12 unfortunately had to make a late race pit stop for a splash of fuel as the race went green for nearly 85 laps. Right back into NTT IndyCar action this weekend, the series and teams have made the trip directly to the Acura Grand Prix of Long Beach. The event which typically brings in large crowds will have a sight to see as these AERO liveries stand out in the car-crazed SoCal scene. Several AutoNation representatives and dealers will be present for the highly anticipated Long Beach weekend to see the pink No. 60 Meyer Shank Racing AERO livery at speed on the 1.968-mile concrete-lined street circuit. As part of the event weekend, the team will feature Acura branding throughout its design in partnership with Acura’s title sponsorship of the event weekend. It will be a busy weekend for RLL as both its IndyCar and IMSA WeatherTech SportsCar Championship entries will be participating in this weekend’s event. The team has scored four total wins, including the Rolex 24 Hours at Daytona, between the two series. Also carrying the AERO Sustainable paint advantage and joining the IMSA action is Corvette Racing with its No. 3 MOBIL 1/SiriusXM Chevy of Jan Magnussen and Antonio Garcia and the No. 4 MOBIL 1/SiriusXM Chevy of Oliver Gavin and Tommy Milner. The team is aiming to score its eighth Long Beach win since 2007. As the IMSA and IndyCar racers will soak in the California sunshine, the European championships will have to endure a stay in the south of France as the season opens with testing and then the first race of the season at the Circuit Paul Ricard in rural France. It was an encouraging start to the year in testing for the No. 22 AERO United Autosports Ligier of Matt Bell and Jim McGuire, who opened the event atop the timing sheets with a best lap time of 1:51.575-seconds to lead the second session of the opening day of Practice. The race, a two hour sprint around the 3.6- mile circuit, will be staged on Saturday night ahead of Sunday’s European Le Lans opener. The performance was not surprising from those who have followed the fortunes of the powerhouse United Autosports squad, which sees the AERO-liveried team return to LMP2 competition with Phil Hanson and Filipe Albuquerque in the No. 22 Ligier JSP217 (though it will be former F1 driver and DTM champion Paul Di Resta at Ricard) and then Alex Brundle racing alongside Ryan Cullen in the No. 32 Ligier JS P217. Garett Grist and Wayne Boyd return to the team to drive the No. 2 Ligier JS P3, with the No. 3 LMP3 entry being wheeled by Mike Guasch and Christian England. United’s 2019 Michelin Le Mans Cup team is once again made up of three Ligier JS P3s. Garett Grist share a Michelin Cup LMP2 with his American IMSA co-driver Rob Hodes in the No. 23, while Naj Husain and Colin Braun return for a second year while McGuire and Bell return for their third season in the #22 AERO Ligier. IMSA’s BUBBA Burger Sports Car Grand Prix will go green on Saturday, April, 13th at 5:00pm ET and will be followed by IndyCar Qualifying, both live on NBCSN. The Acura Grand Prix of Long Beach will be held on Sunday, April 14th at 4:30 PM ET on NBCSN.